Never made a Dutch Baby? Baby are YOU missing out! 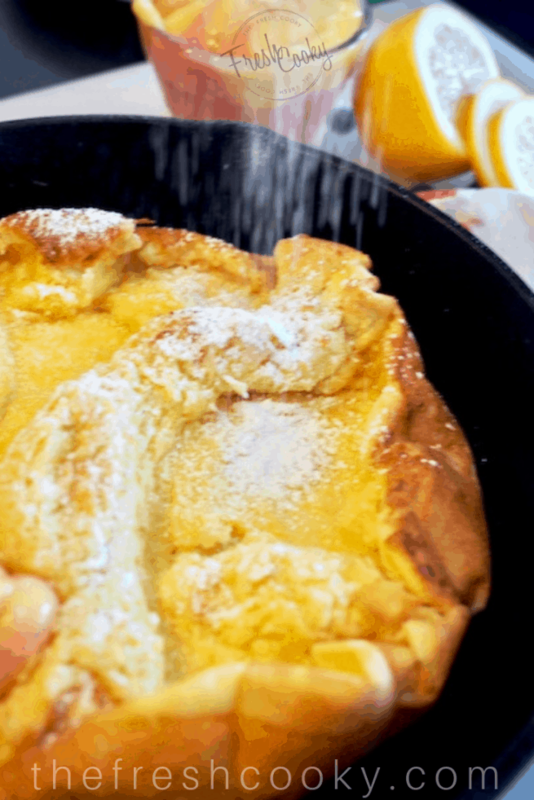 Dutch Babies or German pancakes are an egg-y, easy, crêpe like pancake! Oven baked to huge, fluffy, light pancake perfection! Served with melted butter, a squeeze of lemon and a dusting of powdered sugar. I love breakfast, it’s my FAVORITE meal to eat out, I usually order something I don’t make at home regularly, like Eggs Benedict or pan-fried oatmeal. I love that we eat dessert for breakfast on special occasions…you know those foods that are really desserts masquerading as breakfast foods! Am I right? Donuts, pastries, cinnamon rolls, or streusel coffee cake! I don’t usually eat those things for dinner, do you? So this Dutch Baby fits perfectly into my idea of a special breakfast! Valentine’s Day is around the corner, these “BABIES” are the perfect, quick, yet elegant breakfast to make your family or sweetie on Valentine’s morning! School day? No problem! A Dutch Baby whips up so quickly and bakes while you make lunches or grab a quick shower! Oh and by special occasion, I don’t just mean Mother’s Day or Easter, or even Sunday brunch; go crazy and make it when you are celebrating something truly special like, “I cleaned the bathrooms today” or “I survived my spin class” or “your toddler made it to the potty” or even “I got out of bed this morning.” All teasing aside, what I’m trying to say is that this is so easy and satisfying that you can make it any day of the week, for any reason! See options below for a double Dutch chocolate version! For me, the most difficult part of this recipe, is remembering to bring my eggs to room temperature. If that is you too, simply immerse your eggs in a bowl of very warm (not hot) water while you gather the rest of your ingredients. While you are at it, in a small saucepan over low heat, warm your milk, don’t scald or boil it, it takes a few minutes, swirl or stir occasionally to distribute the heat. Set aside. If it gets too hot (dip your knuckle in) allow to cool or pour between two pans or bowls for a minute until it’s cooled down a bit. Next, preheat your oven to 425° and place butter in a 10″ oven safe skillet*, place skillet in preheated oven to melt butter and heat the pan, should only take a minute or two. *I love my cast iron skillet, they heat evenly & beautifully. You can make it in a larger pan it just won’t puff over the sides or try splitting the batter into a couple of smaller pans. It’s really quite forgiving. 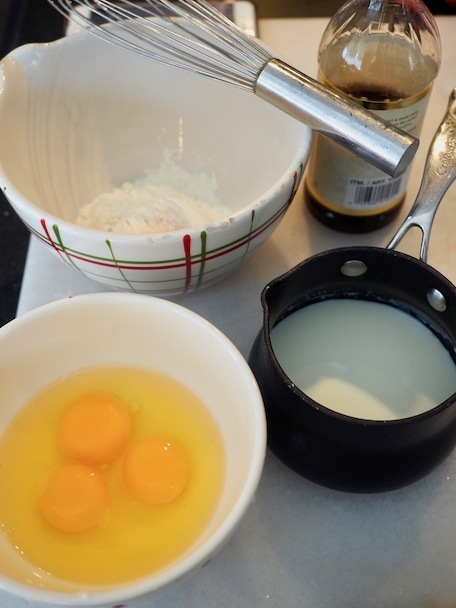 In a batter bowl (or blender); place your warm milk, all-purpose flour, sugar, sea salt vanilla and room temp eggs. Whisk until smooth or blend on low until smooth. Now pour batter into the hot skillet; return to oven. **Don’t forget that handle is hot, I’ve branded my palm several times because I forget, so now as it comes out of the oven, I wrap an oven mit around the handle or use one of these silicone handle covers, so I don’t forget it’s stinking hot! Sometimes, I’m not the smartest pancake on a Sunday morning! Bake until puffed and golden brown, about 15-25 minutes, remove from oven and allow to cool for a few minutes until the puffing goes down slightly. Slice into wedges and serve with melted butter and maple syrup or a dusting of powdered sugar or check out these scrumptious options below! TRADITIONAL DUTCH BABY | Drizzle with melted butter, a dusting of powdered sugar and a squeeze of lemon. My favorite! CHOCOLATE CHIP BABY | Add 1/4 cup chocolate chips (my favorite chips) in batter (variety is your choice). Bake as directed. Once cooled slightly, sprinkle on a few more chips just before serving. Serve with a little melted butter and pure maple syrup or go for it, splash on some chocolate syrup! LUSCIOUS LEMON DUTCH BABY | Add zest of one lemon to batter and if you really want to be indulgent, drop a dollop of lemon curd and dust with powdered sugar. Toss on some fresh blueberries, raspberries, sliced strawberries or blackberries — you get the idea. DOUBLE DUTCH CHOCOLATE BABY | Add 2 tablespoons of Dutch (get it – wink-wink) Processed Cocoa Powder to batter, mix until smooth; bake as directed, serve with a drizzle of maple or chocolate syrup, chocolate chips and if desired sliced strawberries or raspberries — perfect for Valentine’s Day! 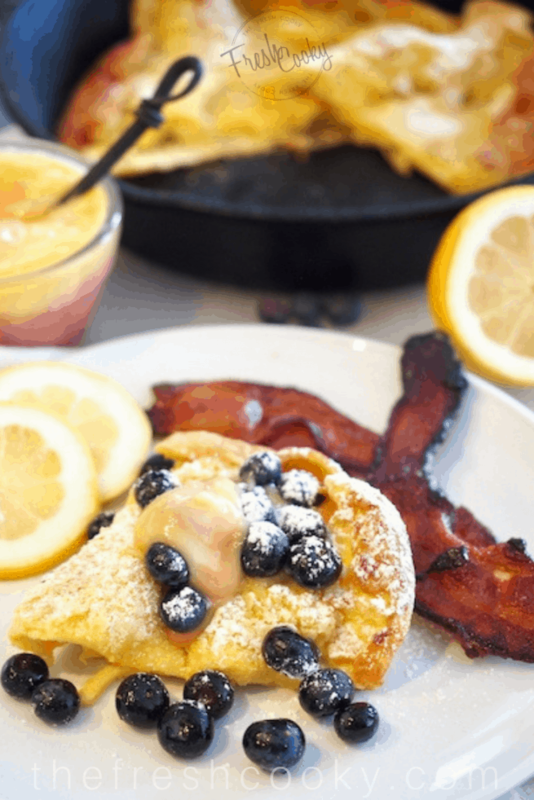 How would you dress your Dutch Baby?? I’d love to hear! Comment below the recipe! 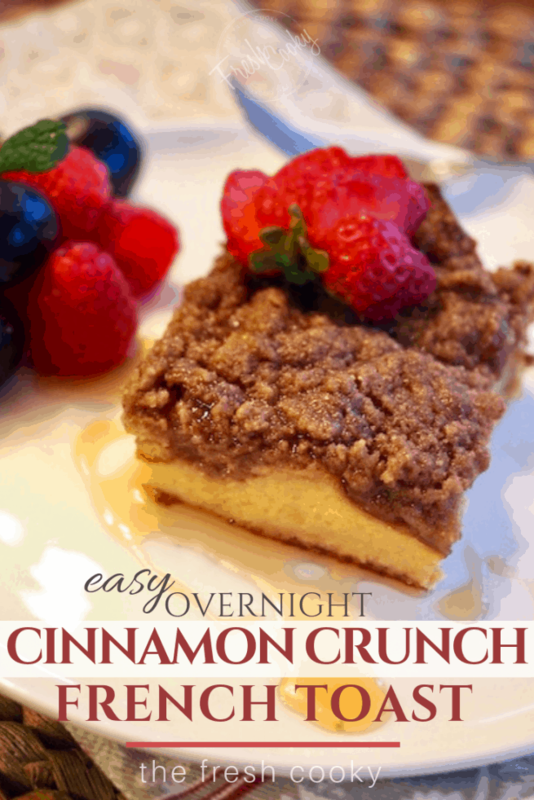 If you like this recipe, give these easy make-ahead breakfast recipes a try! 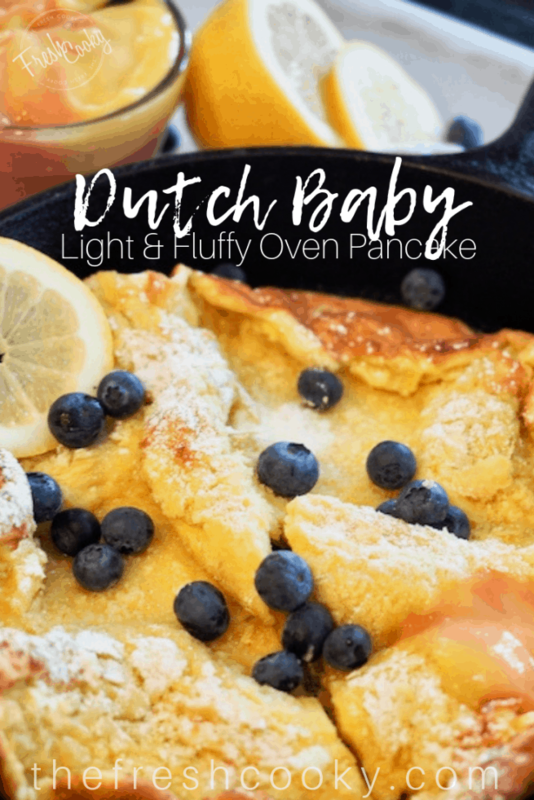 Dutch Babies or German pancakes are an egg-y, crepe like pancake! Oven baked to huge, fluffy, light pancake perfection! Served with melted butter, a squeeze of lemon and a dusting of powdered sugar. 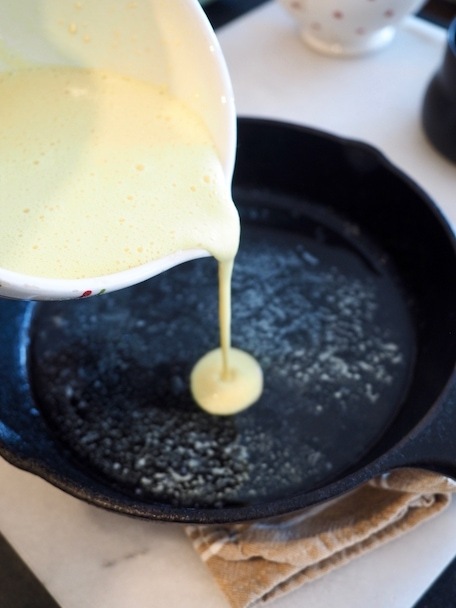 Preheat oven to 425° and place butter into an oven safe skillet (about 10″), place skillet in oven to melt butter and heat the pan, should only take a minute or two. 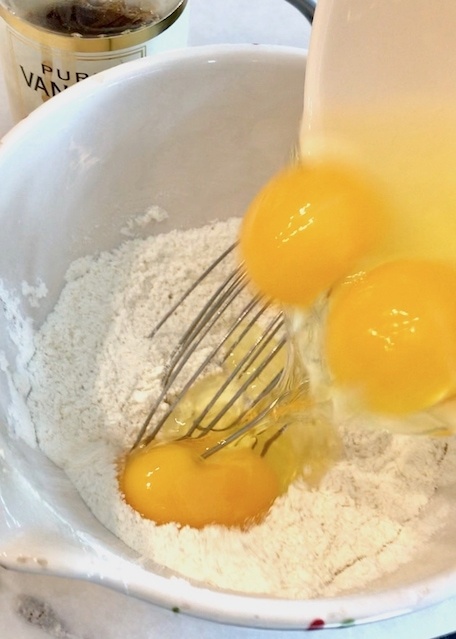 In a batter bowl (or blender); place warm milk, all-purpose flour, sugar, salt, vanilla and room temp eggs. Whisk well until smooth or blend on low until combined and smooth. Slice into wedges and serve with melted butter and maple syrup or a dusting of powdered sugar or check out these options below! CLASSIC DUTCH BABY | Drizzle with melted butter, a dusting of powdered sugar and a squeeze of lemon. My favorite! CHOCOLATE CHIP BABY | Add 1/4 cup chocolate chips to batter (variety of your choice), stir to combine. Bake as directed, remove from oven, allow to cool slightly, sprinkle on a few more chips prior to serving. 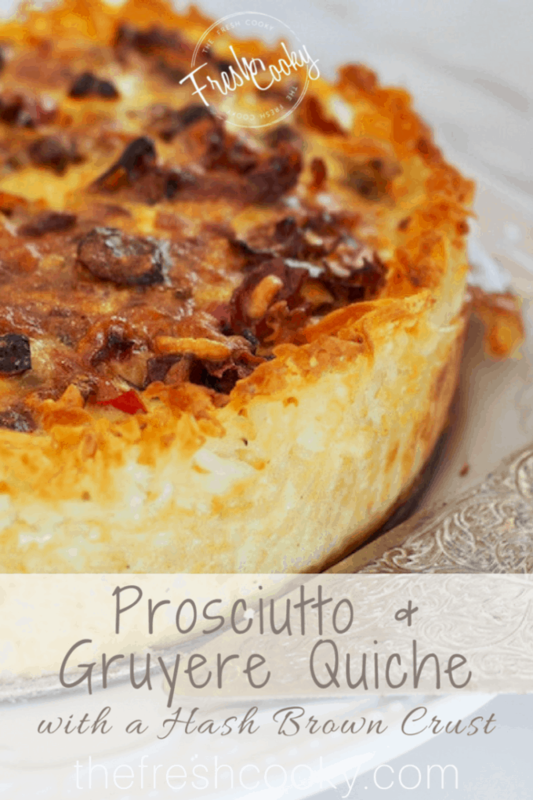 Serve with a melted butter and pure maple syrup or go for it, splash on some chocolate syrup! 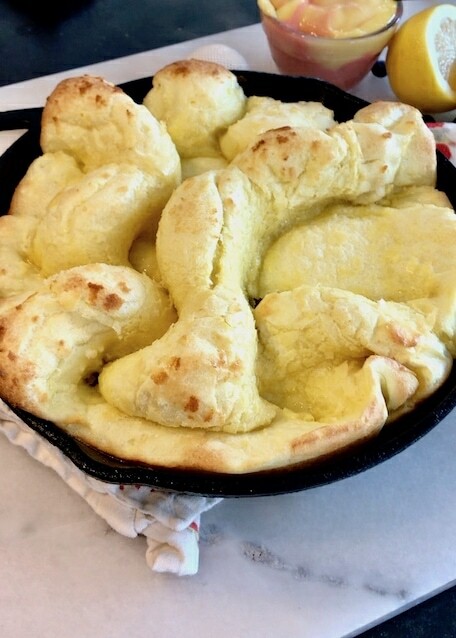 LUSCIOUS LEMON DUTCH BABY | Add zest of one lemon to batter, bake as directed. For a sweet citrusy pop, drop a dollop of lemon curd and dust with powdered sugar. Toss on some fresh blueberries, raspberries, sliced strawberries or blackberries — you get the idea. 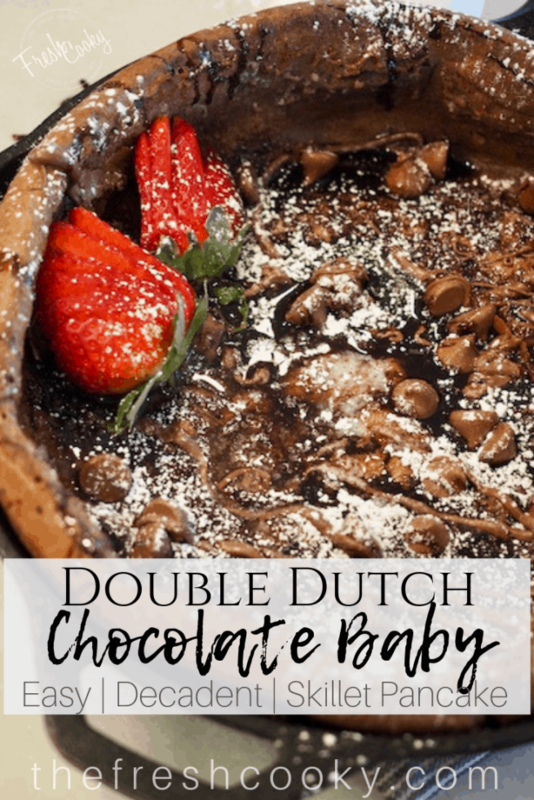 DOUBLE DUTCH CHOCOLATE BABY | Add 2 tablespoons of Dutch Processed Cocoa Powder to batter, mix until smooth, bake as directed, serve with a drizzle of chocolate syrup, chocolate chips and if desired sliced strawberries or raspberries — perfect for Valentine’s Day! © 2019 | This recipe for Dutch Baby Oven Pancake was featured first on The Fresh Cooky.